Bangalore city is also known as “Silicon Valley of India”. It is the capital city of Karnataka state. Another name of Bangalore is Bengaluru. This city is situated on the Deccan Plateau of Southern India. It is a home of various educational & research universities/institutions in India. This city is considered as one of the educational hubs in India. The overall literacy rate of Bangalore is 87.67% as per the recorded census 2011. Candidates check this article to get detailed information about Top Engineering Colleges in Bangalore 2019. 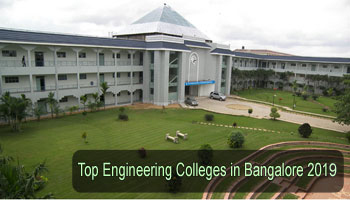 Below, we are presenting a list of top engineering colleges in Bangalore. In this list, we have listed all the government & private institutions which imparts professional education in the field of engineering & technology. We have included all the colleges in our listed by rating them on the basis of several parameters. These parameters are quality education, academic excellence, teaching-learning method, college infrastructure and facilities, placement records, college approval, and affiliation, etc. Candidates who wish to join an engineering course in Bangalore, they will appear for the national level examination known as JEE Main. Through this exam, candidates will get admission to the B.Tech & B.Arch programme. Candidates will also apply for state-level examinations, i.e. COMEDK UGET & KCET. Some universities will also conduct its own admission test to providing admission to the B.Tech course, such as PESSAT, MUOET, etc. For admission to the PG engineering course (M.Tech), candidates must appear for GATE examination. The most trending specializations/disciplines of B.Tech course are Mechanical Engineering, Computer Science & Engineering, Information Technology, Civil Engineering, Aeronautical Engineering, Electrical Engineering, Electronics & Communication Engineering, etc. If you have any other query about Top Engineering Colleges in Bangalore 2019, you can ask us by leaving your comments in the comment box. What is the scop and procedure for other state candidate to get admission in B Tech course in Bangaluru engineering colleges? Is Dr.Ambedkar institute of technology is a good college for engineering..
What about presidency university ranking in the list ? ?